just digestion and friendly grooming. But the thing I like best about the “ring” of poetry is that it can extend beyond my attuned ear to my other senses. There can be poetry in the fresh smell of earth after much needed rain (which I recently learned has a word all to itself: petrichor). There can be poetry in what a storm leaves behind. Sometimes it’s heartbreaking, sometimes it’s redemptive–sometimes it’s both, like the best of written poems. We finally got much needed rain in the northwest this weekend, and we need a lot more, especially to help dowse the huge wildfires burning throughout the region. This rain, however, came with very high winds, at least in Portland–the kind where the curtains fly out into the room and things on patios fall over and rattle around. After the rain, more wind blew out one storm front and helped bring in another. The morning after the first storms blew through, Romeo and I were out taking a walk during a dry but windy interlude. As we were heading home off Alberta Street, we turned onto a side street that has a large fig tree, much of which overhangs the sidewalk. Each time I walk by I count the figs that might be ready, and help myself to one or two that are. They are bright green in color and when they start to turn golden and get soft they are ready to eat. They taste like light and honey. I look forward to every chance I get to eat one. The morning after the storm, I discovered the wind had shaken many of the ripe figs higher up on the tree off the branches to the ground. Many that had fallen were smashed, which was sad to me, but some could be salvaged. I hadn’t planned to collect figs, or even buy groceries that trip, so all I had was my raincoat pocket to carry a few home. There’s another place even more dear to my heart in this new neighborhood that has a fig tree–the Emerson Street Garden, which I wrote about in this recent post. A lovely little garden-in-progress created out of a soil reclamation project of Groundwork Portland, it is a little get-away tucked in between the tightly packed houses. Just inside the wooden gate there is a large fig tree encircled by the gravel path that leads back into the garden. Last night when I was falling asleep I realized that although I hadn’t needed to go down there and water the tomatoes because of the rain, that if Romeo and I walked that way in the morning, we might find some figs had fallen to the ground. This time I came prepared and I was rewarded for my foresight. Romeo waited patiently as I gathered as many of the fallen fruit as could be salvaged. They didn’t have to be perfect or even really clean; I knew I would bring them home and wash them and then come up with some sugar free concoction inspired by this blueberry one from Potato Strong. Take the stems off the figs and chop them in half or in fourths, especially if they are not really soft. Put the figs in a quart sauce pan (I used a non-stick one) and cover the bottom with water (not even an inch, just enough so they don’t stick). Squeeze some lemon juice over the figs (up to a tablespoon) and sprinkle a little bourbon or spiced rum or vanilla in. Cook on low to medium, bringing the figs to a slow boil. 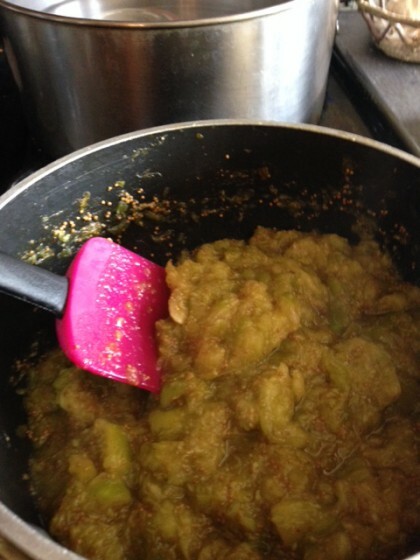 Stir and also mash the figs with a potato masher until they are broken up. (leave some pieces of fig for texture and color–the green is so pretty!). When it thickens enough not to be watery and turns mostly golden and tastes sweet, it’s done. 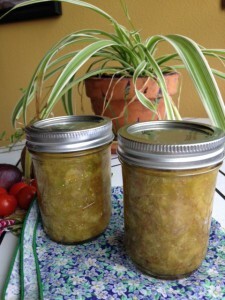 I simply spooned mine into half-pint jars I had put in hot water on the stove and then I covered them with canning lids. I did not process like regular jam, so this compote should be stored in the fridge (or in the freezer if you won’t eat it all within a week) after it’s cooled down. It can be used as a topping on pancakes, oatmeal, toast, in peanut butter sandwiches, on or in banana ice cream, as part of a sauce in a stir fry or an ingredient in a marinade. Notes: This simple recipe depends completely on the quality of the figs. If your figs are ripe and sweet, you may not even want to add anything else but a little water, although the lemon and spirits or vanilla in small amounts help the fig flavor pop. If your figs are not all that sweet when raw, you may want to add some sweetener. But go easy, the figs will sweeten up as they cook. There was a second shooting in my neighborhood, farther from my new house, but right where Romeo and I walked last week as we waited for the Urban Farm Collective market to open. I remember thinking the little school park was uncommonly quiet and empty as we strolled through, and I thought of a fun conversation I had had earlier there this summer, when some folks sitting around one of the picnic tables wanted to know if Romeo was a greyhound. “He’s a sighthound, like a greyhound, but with long hair” I said, and then I told them the fancy name of the breed, Silken Windhound. One of the guys had a twinkle in his eye. “Like a greyhound with an Afro,” he said. “Yes!” I said, and we all laughed. But now there was no one here. It was so quiet it was unsettling, but I brushed it off, not wanting to be too dramatic or fearful. It would be days before I learned that just a couple of hours before we walked through another gang-related shooting had occurred and a young woman was shot in the hand. Mercifully she’s alright. There will be a neighborhood meeting right in the park this week to discuss the facts of the shooting and how we can work together to keep the neighborhood safe. Romeo and I will be there. After I post this recipe here, I will copy a short version of it out in a playful way on art paper and post it beneath the glass on the bulletin board at the Emerson St. Garden. I hope it might entice any other neighbors walking by the garden to enter and pick some figs. The making of this simple fig compote feels like poetry to me, too. It helps me make real the neighborhood I want to live in. A place where the sharing of something sweet between neighbors, and common care for one another can put an end to random violence. I think of it as a kind of edible prayer–fruiting from a tree that helps old wrong-headed knowledge turn a new leaf. Your Fig compote sounds delicious, and your neighborhood walk sounds wonderful (despite the shooting). Thank you Gloria! Yes, my neighborhood walks are filled with wonder, and I feel very lucky to have landed in this neighborhood, challenges and all. My mom was visiting over the weekend, and somehow dogs came up in conversation, and my husband was all, “you should see Maria’s dog, seems pretty perfect.” She had never heard of a silken wolfhound (neither had I until Romeo! ), and thought he was beautiful. And your description of his temperament makes him even more so. I’m sorry to hear about another shooting. It is good that your community is banding together to try to figure out a solution to make the area safer. I’ll keep my fingers crossed for you. As always, this is just too beautiful, Maria. I love the recipe–I think for me, this will be spread onto toast or spooned onto hot oatmeal or quinoa in the morning. Steven will eat it on ice cream. We’ll both love it, because figs are ambrosia indeed! 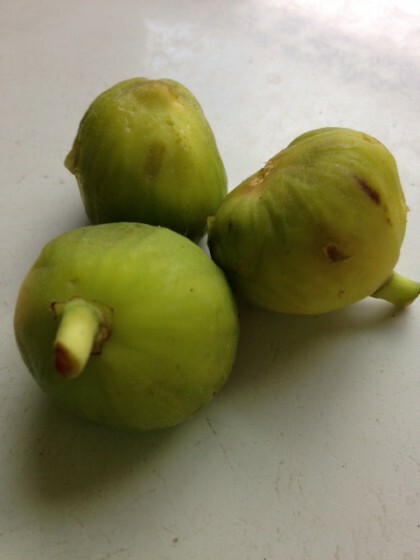 Hi Maria, fresh figs are a gift from above–I’m delighted you have a fig tree so close to you! When I lived in North Carolina, a friend had one in her yard, and eating from it was pure bliss. As it stands now, I have to depend on the fickle mercies of the farmer’s market and Whole Foods.